Soaring up into the London skyline near London Bridge, The Shard is the latest skyscraper to join the capital’s tallest buildings. Standing at a staggering 309 metres tall, it is not only the tallest skyscraper in theUK; it’s the tallest building in Europe. 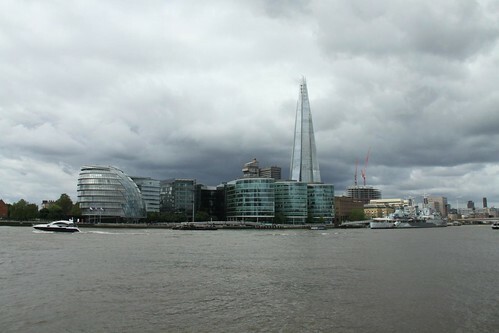 Since construction started in 2009, those passing over the City have been able to see the gradual growth of the building as it rose from the footprint of the demolished Southwark Towers and came to dominate the urban landscape on the South Bank of the Thames. Drawing on lessons learned in the wake of the World Trade Centre disaster, the innovative design and construction is expected to withstand extreme conditions of attack or natural disaster. The Shard hasn’t earned its place in the London skyline without its fair share of controversy. From the very start, Renzo Piano’s design was criticised by English Heritage who called it “a shard of glass through the heart of historic London,” inadvertently giving the building its name. The Shard, completed in may 2012. Over the years of its development and construction the project was plagued by threats to its funding and difficulties with contractors, eventually making it out of the surrounding buildings to stand above them all. There were several occasions where it was feared the project wouldn’t be finished as financiers pulled out and contractors struggled to live within the fixed budget set for construction. Most recently, concerns about security were raised when some extreme urban explorers calling themselves “placehackers” scaled the completed structure to film the view from the top. However, the spectacular video posted by the group on YouTube did more to increase excitement about the development than draw questions about security. The Shard was finally officially opened on 5th July at a formal reception attended by royalty from the UK and the Prime Minister of Qatar – a rightly regal opening for a stately building. What next for The Shard? The external structure of The Shard is now complete and work is moving to the interior, fitting the accommodation inside the building. Plans for use of the space include the creation of office space to replace that demolished when Southwark Towers were knocked down to make space for The Shard, residential apartments and a luxury hotel. If you have a spare £50 million hanging around somewhere, you might be able to secure one of the ten apartments that are slated for development. As some of the most exclusive real estate in the country, the apartments can expect some pretty high-class occupants. If you want to get a cheaper view, why not take a ride on the London Helicopter tours ride and see the building close –up. The Shard stands head, shoulders and knees above the other buildings on the South Bank. If an apartment is about out of your price range, maybe a hotel stay could be more within reach. Shangri-La, the prestigious hotel chain, are due to move into The Shard to start fitting out its hotel. Occupying floors 34 to 52, plans include the creation of the most spacious rooms of any London hotel and balconies over the hotel’s enclosed “wintergarden”. Its restaurants will also offer a unique view of the London skyline. In future, a trip to Londonis likely to include a trip to The Shard to visit the viewing platform. Located on the 72nd floor, you’ll get one of the highest views of the city. On thing the placehackers were able to preview was the incredible vista over the London landscape, and visitors to the city will want to make sure that they include in their stay in London not just a visit to the tallest building in Europe but the chance to see a bird’s eye view of the city. Taking pride of place in the heart ofLondon’s historic centre, The Shard is a piece of innovative design that stands out for more than one reason. While the construction has drawn the gaze of the world on its progress, the final product of many years of planning, design and construction have led to a piece of breathtaking architecture of whichLondoncan be proud. Image Credits: Wikipedia and yaketyyakyak.